I have a question that I've asked a few MUNI fare inspectors, but I just get puzzled looks. So I'm wondering if you would know--or at least be able to understand the question. I have a TransLink card with a FastPass loaded onto it. I've been told that I have to tag my card whenever I get on a bus or enter the Metro POP areas, and generally I do. But today, the faregates at Montgomery were under construction and the only accessible tagger device was broken. A sign said that people with FastPasses could enter the gate, but people paying cash fares had to go to the other booth way down at the other end of the station. Since I have a FastPass on my TransLink, I just entered the gate with my still untagged card. If I were stopped by a fare inspector, could I have been ticketed for not having a "tagged" TransLink card, even though it has a FastPass on it? The intelligent answer should be "no," of course. But I have no confidence that the intelligent answer is the correct answer. You have asked a great question! It could be possible you could get a nagging from the fare inspector for failing to tag the card, but even the odds of having the card checked is sort-of low as they are just well... lazy. While I wait back for some answers in a recent discussion string from KPIX's Eye on Blogs about this, try these ideas: Walk to the other set of faregates or enter the station and tag the card on-board the first train arriving to the station. Interestingly, the POP page on Muni's site says that a pass on TL card is OK, but does not say required to tag. Thanks Akit, your answer was really helpful. The way I read the SFMTA site regarding "What Constitutes Proof of Payment," there are two distinct ways that a TransLink card can constitute POP. One is "A TransLink fare card tagged for the current trip is valid for 90 minutes after tagging." The other is "A TransLink fare card with [a MUNI pass] purchased on it." This MUNI pass option does not say anything about the card needing to be tagged. So I interpret this as meaning I cannot get ticketed for failure to have POP if I have a MUNI pass loaded, even if I don't tag the card. I'm going to print this page out and save it--this will be Exhibit A if I get ticketed! Don't mean to be a buzzkill, but Translink's website says that TL cardholders with a fast pass loaded still need to tag their cards. Buzzkill or not, there's a conflict between two agencies. I'm hoping Muni can give written clarification on the policy. I got a Clipper Card a few months back, and had question regarding transfers with the card (I thought I'd ask you first, SFMTA was never helpful). Clipper has that automated 90 minute transfer period. Suppose I board the N at 2:00, get off, go about my business and board the N again at 3:25. Technically, Clipper wouldn't charge me again since I'm still in my 90 minute period, but what about once that time expires during my transit ride? Could I get a citation for that (since I'm on a POP line)? Clipper is supposed to be all automated and stuff, so it's not like I know to 're-pay' my fare again. You asked a great question that I've been having a lot of questions about too. 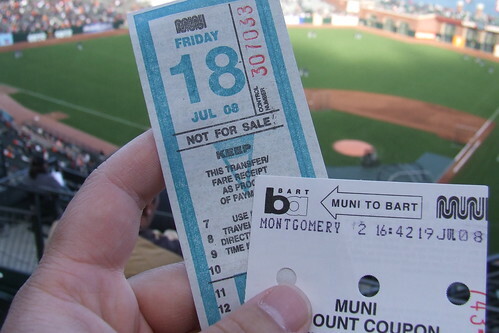 That particular scenario can happen to anyone since while a paper transfer can easily tell you when it will expire, a Clipper card cannot unless if the user is paying attention to the little screen when tagging. I don't really have an answer for this and hopefully the SFMTA can give some clarification about it. I was just researching this exact question (the 90 minute transfer on Muni Metro expiring during a ride even though I tagged Clipper before riding; from above: tagging at 2:00 and again at 3:25). Was anything ever learned from SFMTA about this? Nope. The SFMTA still has the same info on their site and still confuses the heck out of me.